The Hochkönig is a mountain in the Salzburg and also name to an associated massif and one of the state′s official travel destinations. The travel destination comprises of only three communities, Maria Alm, Mühlbach and Dienten. Nevertheless, the Hochkönig region is one of the state′s most important areas for skiing holidays during the winter season and hiking holidays in summer. All three communities are famous ski resorts, mostly targeting families and "non-rowdy" tourists (unlike party resorts, who go for wild twens). The Hochkönig area is member of the Ski Amade, one of the biggest skiing areas in Europe. The ski facilities include 34 ski lifts and 150 kilometres of managed slopes. The Hochkönig area is shared between the Pinzgau and the Pongau regions. Geographically, the Hochkönig massif is part of the Berchtesgadener Alpen, which are generally associated with Germany, since this is where most of this mountain range can be found. Mount Hochkönig itself is 2941 metres high, making it the highest mountain of the Berchtesgadener Alpen. The Hochkönig is famous as a particularly "scenic" mountain and the Mandelwände, a range of cliffs, add to the impression of the Hochkönig as the quintessential Alpine mountain. The Hochkönig feels even higher and more impressive, since it is surrounded by hills of lower altitude; the so-called "topographic prominence" of the Hochkönig is more than 2000 metres, which is one of the highest in all of the Alps. Only Montblanc, Großglockner, Finsteraarhorn, Wildspitze and Piz Bernina have an even higher topographic prominence. In other words: The Hochkönig is one hell of a mountain. 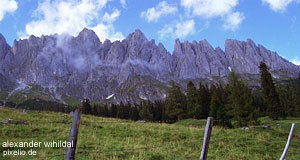 The first time somebody climbed the Hochkönig was in 1826. Until then, the region has been populated since Neolithic times, but only the valleys; high altitudes were - if at all - accessed only for maintaining "Almen" (mountain cabins for managing summer pastures and looking after cattle). Since then, the Hochkönig region has come a long way, with many excellent ski lifts, slopes and an impressive array of hotels. In terms of sightseeing, the region itself has only a church of pilgrimage in Maria Alm, some small museums and a few references to the area's mining past to offer. Mühlbach was an important centre of copper ore mining and Tenneck for iron ore. The industrial mining only ceased in the 1960ies. Only after that tourism started to kick in. Golling, Werfen and Bischofshofen are within easy reach from the Hochkönig villages and if you drive your own car, Salzburg will be a viable day-trip or even half-day-trip destination. The same thing obviously applies to all other things between the Hochkönig and Salzburg, such as Hallein or the region of Berchtesgaden (Eagle′s Nest/Kehlsteinhaus or Lake Königssee).